I say, they’re a fruit. Because the ones that taste like fruit are the best ones. When you’re looking for a tomato, you’re not looking for a bright green one nor a very firm one. You’re looking for intense reds, (perhaps even oranges, and yellows) with a bit of give when gently squeezed – both are signs for high sun exposure and full ripeness which imply higher sugar content and flavour compounds. Essentially, we’re looking for all the qualities that make fruit delicious. If deep down we really believed that tomatoes are a vegetable, we would’ve probably select bred the red out of them back when cauliflower became white. By the way, most green tomatoes are actually just unripe red tomatoes. Same goes with bell peppers. But don’t we “treat them like a vegetable” by roasting them, stewing them, putting them in salads, and/or pairing them with cheese? Last time I checked, we’ve been doing all of the above with apples and strawberries. Guess those two won’t count towards my morning fruit bowl anymore. Pity. 1. Buy fully ripe local tomatoes. Like all fruit, intense color and aroma are signs of ripeness in tomatoes. Give them a little pinch between your fingers – they should feel soft, like they might burst from the tiniest bit more pressure. Sourcing locally guarantees less travelling, which means they are vine-ripened instead of being picked prematurely. Get to know the farmers and vendours, start by asking for their favourite type and a few samples! 2. Season in season. Two birds with one stone here, but first, buy in season. I can’t stress this enough, there’s a time for everything. For tomatoes, it’s July through October here in Ontario. Second, but equally important, season with sea salt and a bit of freshly ground black pepper. I’ve already clarified the perks of salting your fruit. I have to admit, the first salad I ever became drawn to since being exposed to western culture was the caprese. Yet, I seldom attempt it simply because it’s so difficult to find truly delicious tomatoes that are bright and robust in flavour. Indeed, there is not a single perfect tomato, but as I was reading Andy and Michael’s Collards & Carbonara one morning with a lovely pairing of coffee that’s cooled significant from when I first poured it, I realized that I needed a variety to cover all the notes I wanted to hit in my caprese (for me those would be a mellow-sweet one, a bright-sweet one, and one that has a strong “tomato-y flavour”) . So don’t be discouraged by a couple of bland attempts! Go try out varieties that are grown close to you, ask for a taste, and choose the ones you loved most. Remember, if you liked it enough on its own, it can only get better from there! To make the basil oil, pound the basil roughly with a mortar and pestle (or cup and muddler, whatever to thoroughly bruise the basil), with a drizzle of the olive oil. If you want the oil to stay clear, don’t grind, just stick to pounding. Pour in the remaining oil and let it steep while you slice the tomatoes. To get the best slice surface, observe your tomatoes. There is a wall of membrane down the center of the tomato that spans across the flatter, slightly pinched-in sides of the tomato. Make your slice perpendicular to that membrane to expose the juicy seed chambers. 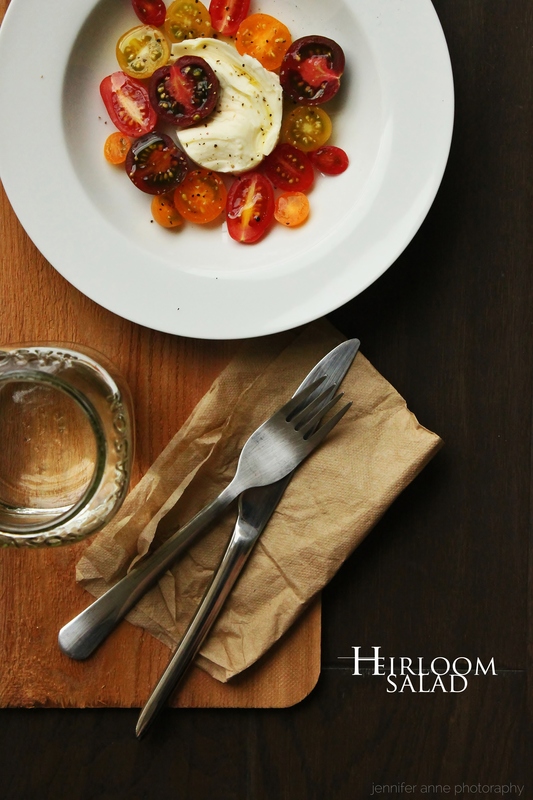 To plate, put the mozzarella on four small plates, arrange the tomatoes on and around each. Drizzle with the steeped oil generously (leave out the basil), and season to taste.